Stories about devastating cyberattacks are plaguing the news every week. You might be thinking your network is secure. You have a sophisticated, layered, defense-in-depth strategy in place. Your customer data—and your business reputation—are undoubtedly secure, but is it? Take a look at yourself through the eyes of the cybercriminals who are making today’s headlines. They know that there is a hole in most defenses and how to exploit it. 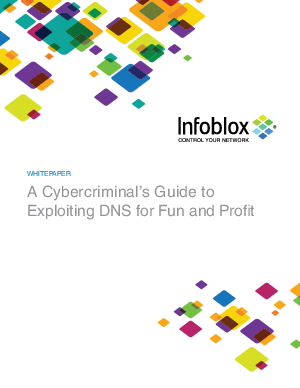 Carrying out a DNS attack is relatively simple for the bad guys because the DNS protocol is easy to exploit. Additionally, there are dozens of types of DNS attacks for them to choose from. These attacks can be used to hijack your systems, steal your data (or your customers’ money), or bring your business to a screeching halt. For a look at a serious and deadly threat, read this white paper; and see your network the way hackers do—as an easy target. Learn how you can effectively secure your external and internal DNS infrastructure today.